Sister Dr Mary Glowrey was a leading humanitarian who is currently on the path to become Australia’s second Saint. She was the first woman to be given papal dispensation to be both a nun and a medical doctor and had a remarkable impact on the health system of India. Dr Nathan Grills from the Melbourne School of Population and Global Health and Academic Lead for the Sister Dr Mary Glowrey Scholars Program said that Sister Dr Glowrey was compelled to act after reading about the appalling death rate amongst babies in India. She joined a Catholic Order, the Congregation of the Society of Jesus, Mary and Joseph and served in Guntor, rural India, from 1920 until her death in 1957. CHAI was created to promote the health of the marginalised across India. It has become the world’s largest health network with an impressive 3518 member institutions which include 2263 health centres, 417 secondary care hospitals, 183 tertiary care hospitals, 200 social service societies and 5 medical colleges and 120 nursing schools. “In keeping with the original concept, there are now more than 1000 sister doctors under CHAI,” Dr Grills said. 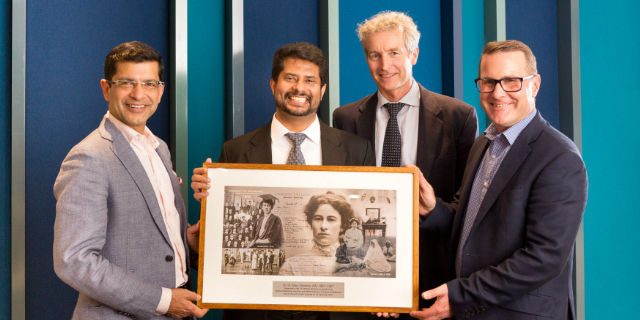 Recognising this enduring contribution, St Vincent’s Health Australia and the Faculty of Medicine, Dentistry and Health Sciences at the University of Melbourne have established the Sister Mary Glowrey Scholars Program to support health professionals from CHAI to gain training and skills from Melbourne. The current Director-General of CHAI, Father Dr Mathew Abraham, recently visited Melbourne to inaugurate this scholars program. Sr Dr Mary Glowrey JMJ was declared a Servant of God in March 2013 by the Bishop of Guntur, the first of four official approvals necessary to commence the process. If declared a Saint, she will be Australia’s second official Saint after St Mary of the Cross MacKillop was canonised in 2011; both women from Melbourne.